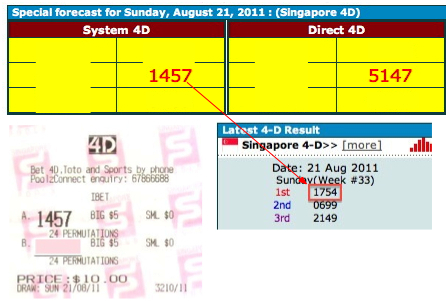 If you are a Gold member, you will notice this system number 1457 been forecasted in our special forecast category. It is one of the highlighted in RED, which means the best of the best set to play. Congratulation, if you did play this. It is not an easy task to narrow these 4D numbers. I have to go through many cycle of testing to get the good numbers. Therefore, it may seem easy but a few hours are needed to pick the good set. Some of the winning ticket I received included in the image below. Join or Upgrade to Gold membership to see the special forecast numbers on each draw.